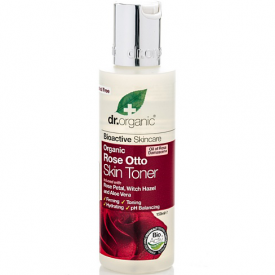 Pure Organic Rose Otto Oil is an uplifting aromatic essential oil, acclaimed through the ages for its use in natural skin and hair care. 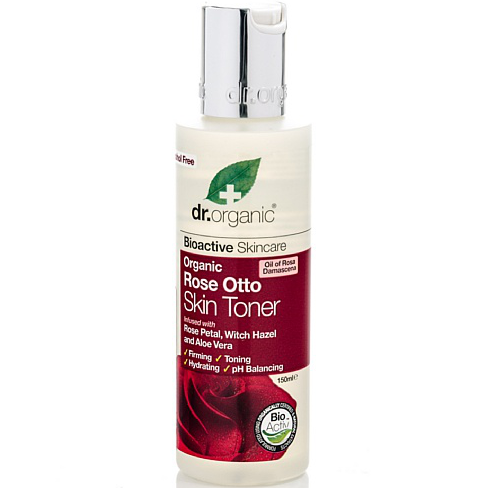 By combining this precious essential oil together with a proprietary blend of bioactive natural and organic ingredients including Rose Water, Witch Hazel and Aloe Vera we have created a gentle purifying and stimulating toner that leaves the skins surface naturally hydrated and balanced whilst refreshing and uplifting the senses. Apply to cotton wool and wipe gently in upward movements over skin morning and night. 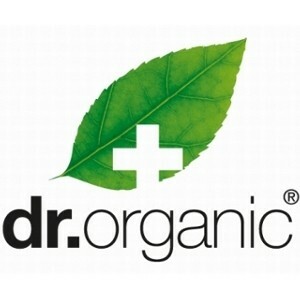 For best results use Dr Organic Rose Cleansing Milk before and follow with a Dr Organic moisturiser. Aloe barbadensis leaf extract, Aqua (water), Hamamelis virginiana (witch hazel) flower water, Glycerin, Rosa damascena flower water, Sodium PCASodium lactate, Arginine, Aspartic acid, Amino acids, Panthenol, Rosa damascena flower extract, Passiflora incarnata extract, Tilia europaea flower extract, Calendula officinalis flower extract, Chamomilla recutita flower extract, Ascorbic acid, Parfum, Pelargonium graveolens (geranium) oil, Eugenia caryophyllata (clove) flower oil, Rosa damascena (rose) flower oil, Polyglyceryl-4 caprate, Sodium ascorbyl phosphate, Sodium benzoate, Potassium sorbate, Citronellol, Geraniol. "I found this had a really refreshing and pleasant scent. It was gentle on my skin and left my face feeling clean but not tight..."